Hooray! We have moved. I am now the proud part owner of a veritable mansion. So what if I have to survive on plain rice and potatoes for the rest of my life? Of course, that's if the heating works and I don't die of hypothermia first. It's been a while since we last moved. And two kids in tow certainly upped the ante somewhat. I have learnt three important lessons through this terrifying and traumatic experience: builders are best avoided, trainers do have their uses and housewarming guests can get you dangerously drunk! Two weeks of 25-cent tours later, the brother-in-law declared that I hadn't cooked a proper curry yet. The Kheema Pulao I was religiously perfecting clearly didn't count... so I planned a mini feast for us in my swanky kitchen. I was there, fabulous in the matt grey perfection, wall-to-wall appliances behind me, oversized cooker in front of me, shower cap on top of me, when I realised I had no salt and no sunflower oil. Some things really don't change. I found some salt in a shaker somewhere. But oil? This was terrible! Can't cook in ghee as it's too fatty. Sesame seed oil would be plain wrong. And Argan oil just awful. The boys took swipes at the "published cookbook author", while I reached shakily for the olive oil in the dastardly new pull out larder. Those of you who know me will know that cooking Indian food with olive oil is one of my biggest no nos. Very hip in some parts. But frankly, too full of flavour, too expensive and too wrong. Left without an option, I valiantly carried on. And the recipe title gave me hope - Chicken Pasanda, or literally, chicken how you like it. 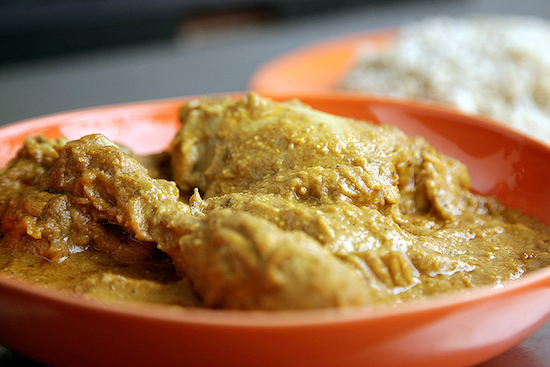 This is a rich and mild curry where the chicken is stewed in its own juices. Perfect for a cosy evening in. Best of all? The olive oil was hardly noticeable. Like the Big house move, I'm not sure I'd do the Olive Oil thing again though! Chop the onion, ginger and garlic into little pieces. Bring the oil to heat on high in a large pot. When it’s hot, add the cinnamon, bay leaves, coriander and cumin. As they sizzle up, throw in the onion, ginger, garlic. Fry for about 10 minutes until the masala is golden brown. Next, add the turmeric powder, chop the tomatoes and add them in stirring furiously. Fry this mixture for about five minutes, adding half a cup of warm water if it the masala starts getting stuck to the bottom of the pot. Then spoon in the yoghurt, give it a good mix, lower the heat to a medium and wait two minutes or so until little oily holes start appearing on the surface of the masala. When this happens, the quickest thing to do it to fish out the bay leaf and cinnamon, take a hand blender and go straight into the pot and puree the rest of the ingredients into a smooth paste. Don’t worry about the bits of cumin and coriander seeds – you will hardly clock them in the end result. When you have a creamy orange curry base, add in the chicken pieces, whack the heat up again to high and stir viciously to brown the meat. The curry might splatter a bit, but it will all be worth it in the end. When the chicken pieces are white all over,mix in the ground almond, lower the heat to medium again and cook covered for half an hour, stirring every five minutes or so until the meat separates from the bones on the chicken legs. Add salt to taste. Serve hot, with toasted pitta breads to scoop up the thick curry. Dal, optional. Love the flavours in this, must try! You seem to have left the chicken out of the ingredients list – is it 1kg of chicken pieces? Loved this line where you said that, “So what if I have to survive on Â£1, plain rice and potatoes for the rest of my life?” 😀 so we are all bhaat-alusheddho ppl at the bottom of our hearts! 😀 congrats for the house and thanks for the recipe! Allo allo, was wondering why you’d disappeared! Things like this happen to me ALL the time, glad I have company! Wow, congrats to your new home and want to try this recipe out. But when do you take out the cinnamon stick and bay leaves? A peek into that new kitchen will be great. Oh this chicken looks delicious Olive oil or not. I just can’t bring myself to use olive oil in Indian cooking but the few times I have used it, nothing bad happened and everything still tasted good without any overpowering taste change or smell. Maybe I’d draw the line at using it in Sambhar that is till I try it I guess. The image is really mouthwatering and I gonna try this at home! Thanks for sharing. So happy to see your blog back! I had missed your posts and recipes, which are among my favorites. Congratulations on the move, and long may you enjoy your new home. I’ve posted something on my own blog today that you might like, as it’s about an essential cooking ingredient (not oil!) -here’s the link if you’re interested: Lowly Bulb, Simple Beauty. Congratulations for the big move and your brand new home! May it be filled with peace love and happiness. Hi M, first of all-great website! I love your recipes and as a doctor and a mum of two very young ones (nearly 3, and nearly 1) I find your recipes allow me to still cook Indian food in limited time. I’ve had success with most of your recipes but in this case, found that even with crazy amounts of blending the husks of the coriander seeds were annoying when eating-especially as the sauce was so delicious otherwise. Am I doing something wrong? My mum was suggesting next time I dry roast the whole spices before chucking them into the oil but I’m not sure I’d get the same great taste?